Insights from Steve Tsang, Professor of Contemporary Chinese Studies, University of Nottingham. How would you assess the U.S. rebalance to Asia thus far, and how might the next U.S. president optimize the rebalance’s impact? The rebalance has signaled the importance the United States puts on Asia, which has reassured U.S. allies in the region but raised alarm in China. It has not sufficiently deterred China from pursuing its regional ambitions, over Taiwan or maritime disputes in the East and South China Seas. But it has enabled countries in East and Southeast Asia to reconsider how they can deal with the rise of an assertive China. To make the rebalance work towards sustaining regional peace and good order, a future U.S. administration needs to engage China with clarity and determination on the one hand and with diplomacy and reassurance of non-aggressive intent on the other. Beijing will continue to view the rebalance with suspicion, and needs to be persuaded that the rise of China as such is not a problem for Washington. It is how China asserts itself, particularly by marking out maritime spheres of influence, that is problematic. U.S. Asia policy is one dimension of U.S. foreign policy. How should the next White House articulate Asia’s strategic relevance in U.S. foreign policy? One of the most basic foreign policy issues a new administration needs to address is determining the importance of Asia to the U.S. in global strategic terms. It also needs to decide how much resource and attention it is prepared to devote to Asia. Any message a new U.S. administration chooses to send to the region will not be taken seriously unless Asia’s policymakers see the policy matches the administration’s articulated strategic vision and the resources allocated to implement the policy. Barack Obama is the first “Pacific president” the U.S. has ever had, but his policy of rebalancing to Asia has only limited credibility, as his administration appears to suffer from a kind of “post-Iraq syndrome” and is preoccupied with other pressing challenges elsewhere. A new U.S. administration will still face essentially the same challenges, but if it articulates a clear strategic view of U.S. priorities globally, its Asia policy will be understood more readily and taken more seriously. What would three scenarios – good, bad and ugly – for future U.S.-China relations look like? A good scenario will be for China to manage its rise carefully and play an appropriate leading role in the international community without trying to outsmart and push the U.S. to retire to the eastern half of the Pacific Ocean. This requires China accepting the right of the U.S. to operate in the Pacific as a whole and navigate freely in international waters along the China coast. A bad scenario will involve China and the U.S. in a conflict that started as a local incident in maritime Asia, leading to unintended escalation but short of a full-scale war. Many different “triggers” could precipitate tension. 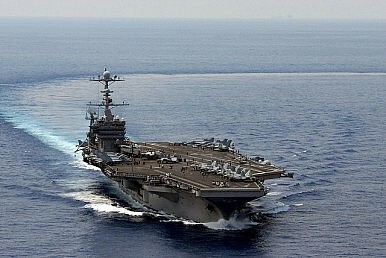 It could start with one of the maritime disputes, with the U.S. getting dragged in as its Asian ally cannot cope with a Chinese challenge and thereby secures active U.S. support. An ugly one may involve China and the U.S. in a non-military or not full-scale military confrontation, with U.S. personnel in China being put under great pressure or the U.S. embassy besieged while the two governments seek to resolve whatever triggered a nationalistic anti-American outburst. It could be the result of a series of fatal incidents involving U.S. ships or aircraft asserting the freedom of navigation within 12 miles of the new man-made “islands” in the South China Sea, but unwittingly getting caught up in incidents with Chinese ships or aircraft. Is the European Union pursuing a “pivot to Asia” policy? If not, what are the core objectives of the EU’s Asia strategy? The European Union is not yet able to present a coherent Asia policy that enjoys the support of all member states. It therefore cannot have a policy to “pivot to Asia.” But the EU increasingly recognizes the importance of Asia, in particular of China. The EU’s “Asia strategy,” such as it is, is to make the most of China and emergent Asia’s opportunities for complementary economic benefits. The strategic implications of the rise of China’s military power are largely ignored. More generally, members of the EU suffer from Beijing’s divide-and-rule approach as they are not able to develop a common China policy. How should the next U.S. president engage the European Union in managing China’s growing economic and geopolitical influence across Asia and the globe? A good starting point is for the next U.S. president to engage with European leaders on their shared core interests globally, and exchange views on how China’s rise may affect them. The basic common ground would be ensuring that a rising (or, for that matter, collapsing) China will not destabilize the international order or push back the advances in progress, both in human rights and quality of life, achieved since the end of the Cold War. From the EU’s perspective, the rise of China’s military capabilities is not threatening, but actions that result in changing international norms can be. China asserting effective control over reefs and rocks in the South China Sea does not threaten European interests, but China doing so in violation of the United Nations Convention on the Law of the Sea (UNCLOS) does. The EU can be persuaded to support the U.S. in defense of international law, but not as part of U.S. attempts to contain China.